What are the Finishing Options for Fabric Flags? One question we get quite a bit is what are the flag finishing options. There are several finishing options available including a left header with grommets, hems and grommets and pole pockets. The standard finishing option is the left header with grommets. We add a piece of canvas to the left side of the flag that is about one inch wide. The canvas is sewn onto the flag for added strength and grommets are placed at the top and bottom of the left header. The rest of the flag is sewn around the edges. The flag hems are sewn, not heat welded like vinyl banners. The hem line is very close to the edge of the flag around the perimeter. Grommets are placed in the corners and every 2-4 feet around the flag if needed. This option is commonly used for fabric banners. The main difference is the fabrics. Click for more information about flag fabric materials or banner fabric materials. We can also sew pole pockets on the flag. When you have pole pockets, we recommend having your art work at least 4 inches away from the edge of the flag to prevent having seams run through your graphics. Click here to get started on your fabric flag. 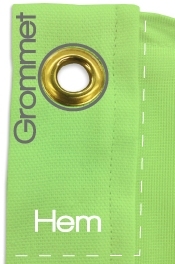 What are hems and grommets?